I had vowed never to run another marathon after Brighton 2014, but here I was again signed up and training, this time for the London Marathon 2015! 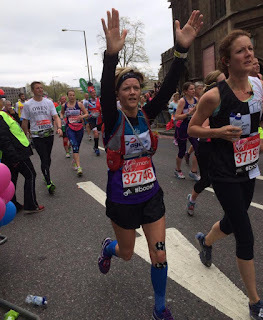 I had banished my demons and had tried to draw out all the positives from my first 26.2. Training had started well but by December my ITband was causing me a lot of pain and by New Years eve I could barely run half a mile let alone my scheduled long run! What I had learnt from last time was to get help and fast! I ended up with a little support crew, which included, a physiotherapist, a sports therapist and a biomechanics coach and between them they patched me back up, made me stronger and then sent me back out to train. I spent hours every night rehabbing my legs, foam rollering and strengthening my glutes and finally it paid off. By February I was running 8 miles at marathon pace and feeling strong. March was an excellent month and all the cross training that I had added to my schedule was finally working, my PB at Paddock Wood half Marathon provided me with a confidence boost, that was needed and I started to believe I could run London in under 5 hours. My last long training run of 22 miles was amazing and my running friends made it easy, I was happy that I had made it to London with no further injuries. I planned my taper week with military precision, taking into account fuel, hydration and sleep. OMG I was ready! I found myself at Greenwich park on April 26th 2015, giddy with nerves and excitement. The kind of excitement I would've experienced at Christmas as a child, but a new feeling to me as an adult. I nervously made my way to my starting pen and chatted away to runners and rhinos! The runners in front, started to shuffle forward and within a few minutes I was running out of Greenwich park and over the start line! “This is it, I’m actually doing it! 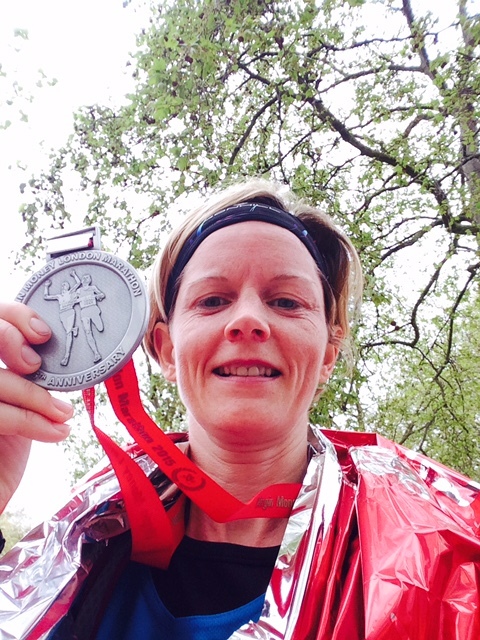 I’m actually running the London Marathon!” I said out loud, to no one in particular. I felt so alive and euphoric that most of the first 6 miles went past me in a blur. Every time I went past another mile marker I rejoiced and shouted “ Yes” and added a little fist pump towards the sky. I was up to mile 9 when my girlfriend and friends spotted me, after a quick hug I carried on, determined to keep my average pace up and to keep running the mile I was in. My reaction on seeing my friends. The next thing I knew I was turning into and running over Tower Bridge! On approaching this iconic landmark I was almost halfway round the course, the crowd cheering was overwhelming, feeling slightly emotional, I choked back the tears. I felt proud to be part of one of the World's biggest and best marathons. Keep your head up, keep your heart strong! I had run for almost 3 hours by the time I was passing through the Isle of Dogs. I had absorbed the crowds energy, hi-fived children and waved for the cameras. I needed to get the next hour done and dusted and mentally I needed to get some me time! I stuck my iPod on and blasted my specially crafted marathon playlist into my ears! The London Virgin Marathon is extremely hard to get a Ballot place for but I had decided to run for a charity close to my heart, Age Uk. By choosing to run for a charity you can gain a place easily and raising money can be great fun! It’s such a weird and wonderful day, one minute you can be running alongside Forest Gump or Jesus and then the next minute you can be behind a runner in a Pamela Anderson Baywatch outfit! I remember running past one of the porto loo’s and laughing out loud as a runner in a rhino suit wrestled himself into the loo! I’ve no idea how anyone manages to run in such a large and outlandish costume but I have the upmost respect for them. I had now reached mile 21 and waved frantically at some more friends and turned my music off. Every time I passed another mile I laughed and smiled to myself. The landmarks of London whizzed by which helped to pass the time. Big Ben now loomed towards me and my heart started to beat faster! The crowds roared and cheered, shouting out runners names and encouraging them on the final mile. It was exhilarating and my adrenalin was pumping. I felt like an athlete who had just won gold at the Olympics! Within seconds I had turned right onto The Mall, Buckingham Palace was a blur behind me and I was heading towards the finish line. I caught the eye of the runner next to me and she asked me “ Is that the finish?” I nodded and smiled and then we both sprinted for it! As I crossed the finish line I flung my arms up into the air and smiled! I had done it in style and gained a new PB of 4.28. I was given an awesome medal and a goodie bag and as I marched through to the meeting area for friends and family, it suddenly dawned on me how much it looked like a battle ground. Wrecked bodies were strewn everywhere, broken runners, hobbling and crying with silver foil blankets wrapped around them. Blistered and bleeding feet were on full display but generally most of the faces expressed the same emotion as me, happiness. I felt elated that I had got around 26.2 without hitting the wall or gaining any injuries! Absolutely chuffed that I got around 26.2 miles. I have recently set myself a challenge of 50 marathons before my 50 birthday. 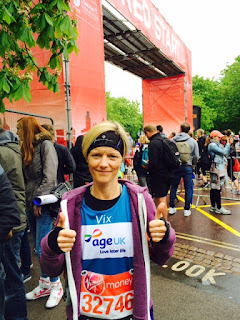 Brighton Marathon 2014 - My first and last?